The town of Maccagno, Italy with Lago Maggiore in the backgroud. I had an excellent time at SoundSCAPE 2016! Boy, it's been a while since my last blog post. Unfortunately, my 6-year-old computer has been really unstable on certain sites and crashes whenever I try to edit the site, so the blog has been on hiatus for about a year now. BUT I've managed to get my hands on my sister's old Chrome Book, so hopefully, I'll be breathing new life into the blog. It would take too long to update you on all my activities since my last post, but I'll mention that a highlight of the last year has been the premiere of my new string quartet: Syadvada at the 2016 SoundSCAPE Festival in Maccagno, Italy! I'm also working with some excellent Ithacans to bring the piece to life on this side of the Atlantic. I met some incredible musicians at the festival, and I'm incredibly grateful to have been able to add to the conversations that were had there. ​Rather than reminiscing about my other activities this past year, I thought I'd talk about a piece I'm writing now: Cicada for String Quartet and Oboe, specifically the fourth movement, whose musical material is derived from the DNA sequence of a bacterium! In this post, I want to talk about the various processes I'm using to decode the various combinations of G, A, T, and C into music. This article will assume a basic foreknowlege of genetic biology, as providing that would go beyond the scope of a simple blog (yet still admittedly long) post. BUT, if you need to refresh your High School Bio chops, this vid, this vid, and others in the same series should give you a crash course (I certainly needed to re-learn a few things before embarking on this project). Cicada was commissoned by Jake Gunnar Walsh, a composer, oboist, and dear friend. The work was originally to be written for his senior oboe recital at Ithaca College along with several works commissioned from other composers, but for various reasons, Jake decided to hold off on the commissioned works for the performance. I was thrilled at this news, because what was originally to be a short 10 minute work was beginning to evolve—no pun intended—in to a full blown six-movement piece roughly 45 minutes long. Postponing the premiere has given me time to work on the piece in greater depth, which is great, because the fourth movement—what this post is about—is perhaps the most tedious and arduous piece of music I've ever had the pleasure of writing! Note that the parentheses aren't part of the movement titles. In the words of one my favorite composers, Kate Soper, "Something I like about being a composer is that it gives you an excuse to deeply investigate anything." That has certainly rung true with Cicada, and, as you shall see, in addition to being a coalescence of many different musical and literary ideas, composing the work has given me the chance to deeply explore genetic biology, entomology, organic chemistry, and evolutionary biology—​passions I never knew I had before embarking on this compositional journey! During the 2015 VIPA Festival, I had the pleasure of spending time with composer Ricardo Zohn-Muldoon. During my lessons with him and throughout the various talks he gave at the festival he kept coming back to the concept of what he called "musical DNA," a kind of musical atom, a seed from which all other aspects of a piece are born, thus unifying the musical ideas in the work. As this metaphor for motivic economy rolled around in my brain, it suddenly struck me: What if one could do this literally? What if one could literally create music from real DNA--a sequenced genome? When I began working on Symbiosis, I realized it would be the perfect opportunity for me to sink my teeth deeply into this question. Ithaca College Improvisation Ensemble performing Felipe Nieto's Variations Over an Occurrence. Between this and my last post, a lot has happened! I finished my undergrad, for one. I also spent a few weeks in Spain at a killer summer festival that I'll talk about below. I've finished some projects and begun a few others. Shall we dive right in? The final semester of my undergrad was an incredible one. I had a great time making music in the Ithaca College Improvisation Ensemble led by Louise Mygatt. In a nutshell, the group performs improvised works of every sort: jazz, minimalism, klangfarbenmelodie-esque music, and everything in between. The pieces range from being heavily structured—with predetermined "roadmaps" that the performers follow—to being completely free where every decision is made in the moment. We explored improvisation combined with multimedia such as visual art and poetry, and we explored extended techniques of every instrument in the ensemble. It was a highly experimental environment, and a composer's dream come true. Moreover, the ensemble was stacked with killer performers and composers; there was no dead weight. It was great fun and I'm super thankful to all the members of the group for making my last semester at Ithaca so fun! The rest of my semester was spent writing the piece that would eventually be premiered in Valencia, Spain by the premier new music ensemble, Eastman BroadBand. That piece is Difrasismos. You can read more about the work on the piece's page, but to summarize, the piece is based on the Nahuatl (the language of the Aztecs) linguistic structure of the same name that I learned about studying World Religions with professor Jonathan L. Jackson. Basically—according to Nahuatl scholar Miguel León Portilla—when the Aztecs “wanted to endow an idea with maximum clarity and precision, they always isolated two of its qualities,” and used those qualities to describe the idea through eloquent and succinct metaphor. The piece tries to do the same thing with a two movement structure. Writing the piece was great fun! It ended up kind of being an exercise in string writing, because it involves a large amount of natural harmonic trills. I finished the piece in April, but I would have to wait until July to hear the performance in Valencia, Spain. Everyone is so nice and so cool and I love it. L to R: Composers Peter Dayton, Vincent Euliano, Jessica Rudman, Eric Evans, Adriel miles, Me. My trip to Spain was incredible. I went to Spain to participate in the Valencia International Performance Academy's (VIPA) summer festival, which was an absolute delight. The festival is the brainchild of composers Jason Thorpe Buchanan, Jorge Grossmann, and Carlos Amat. I wish I had had time to journal all my experiences at the festival day by day, but the schedule was so jam packed, we were beat every single night. It was an awesome experience, however. I met some incredible people, both composers and performers (I'll try to like to their sites in the Links section of the website here), and reconnected with some great friends, such as Adriel miles, Jorge Grossmann, and Matthew Recio. It was incredible being surrounded by people who were so likeminded. On the very first day, all the composers who were there so far had dinner together. We immediately hit it off and became instant friends, having brilliant discussions about music that then branched out into every aspect of life. As the festival continued, it was invigorating to be around so many great thinkers who thought about music differently from myself. One of my favorite things in the universe is being exposed to new ways of thinking about music, and there was plenty of that in this festival. The composer in residence were my former professor, Jorge Grossmann, Ricardo Zohn-Muldoon from Eastman, and Stefano Gervasoni from the Paris Conservatory. Carlos Sánchez-Gutiérrez was also there for a few days for masterclasses. My piece Difrasismos got premiered by the Eastman BroadBand ensemble, which was awesome. Recording of that should be up soon. All in all, I can't recommend this festival enough. The people are amazing. The program is great. The performances are sensitive. Spanish wine is inexpensive and delicious. What else do you need? Next year Eastman BroadBand is coming back, as is the Mivos string quartet. NOMOS Group and Jason's Switch Ensemble is also going to be there. Application info for next year hasn't been released yet, but keep it on your radar because last year they made it so if you applied before a certain day, your application fee was waived. You can learn more about the festival here. My first time in the Mediterranean Sea was unforgettable. Valencian beaches are super nice. Valencia is also a beautiful city. It was really hot there, as you can imagine. Spain in the summer is no joke—both the culture and the climate remind me of my days in Puerto Rico. The beaches were amazing. Soft sand. Shallow, gradually sloping shorlines, and warm and easy waves. Swimming in the Mediterranean Sea for the first time was a primal and invigorating experience—so much history on those waters. On the last day of the festival, we took a boat ride on the Albufera—a freshwater lagoon just south of the city. The lagoon is home to a lot of wildlife and is only a meter or two deep and has these huge reeds in places that reach like 12 feet up in the air or more. It's such an iconic place, and I'm so happy I got a chance to go, especially as a shared experience with the other composers. Check out the Photos section for more pics of that! After the festival, we took a trip up the coast to Barcelona for a couple days, during which I celebrated my 23rd birthday! Spent a great time checking out the National Art Museum of Catalonia and hanging with friends both new and old. Then we came back to the states. Incidentally, our flights to and from Spain involved two 18-hour layovers in Istanbul, Turkey. That was a ridiculously interesting experience to say the least. Mainly because it's such a completely different culture with a totally different language. Adriel and I managed to get around and make the most of out 18 hours by checking out a bit of the Turkish night life. Unfortunately, on the trip back, we got ripped off by a crooked cab driver. Because the Turkish Lira isn't even close to being as strong a currency as the dollar, I only lost about 15 dollars, but it's the principle of the thing. Still, Turkey was a cool place. There's so much history there, and the landscape is gorgeous: mosque spires adorn the horizon as far as the eye can see. If the political climate ever gets better, it would be nice to eventually go back and spend a longer time there to learn more about what it's really like. I think like a week after we left, the Istanbul police station was bombed. So maybe wait a while before going back. Turkish Airlines is awesome, though. They're one of the best airlines I've ever used. Since our layover was longer than 10 hours, they comped us a hotel room both ways. Great stuff. That was my summer. In the Fall I got hired as the Music Director of South Windsor High School's Fall production of Mary Poppins. The show just ended this last weekend, and I might write another blog post about that, but it was one of the most terrifying, fun, challenging, and rewarding experiences I've had in a while. I spent a week in October visiting Ithaca to support friend, fellow composer, and Quadruplex member Jake Walsh at his Senior Composition Recital which was awesome. I think I cried at it. It was that good. I also spent time visiting the Eastman School of Music in Rochester and fell in love with it. It's become my top choice for grad school, and if I get in there, I'm definitely going. An arrangement of my Six Word Stories for seven-part a cappella vocal ensemble. This will include some of the old ones, but also some new ones as well. I may continue to explore this genre and write more songs for Soprano and Ensemble or Bass and Guitar. A new string quartet that I began working on in Spain. That's all for now, since grad school apps will demand a lot of my attention. Adriel and I taking a recital selfie. Just giving you an update regarding my composerly activities. My senior recital, Life is a Dream, took place on November 16th and was an incredible experience. The performers killed it, and I couldn't be more proud. Of course, there were a few hiccups here and there, so we may see a few recording sessions in the spring time to iron things out. To the right you can see a selfie my friend Adriel and I took during intermission. Fun stuff. I've managed to upload a couple videos of the performances to YouTube. Still need to edit the performance of La Vida Es Sueño—which is done, by the way. Eternity in Bloom, I. Inflate and Seven Six Word Stories, however, are edited and uploaded. I'll link those up below. If you're interested in downloading the program notes for my recital, I'll link them up here, it's a pretty big file, though, so be aware. Most of the info for the individual pieces is on each piece's page, but I'm going to reprint the Recital Acknowledgements below, since I'm incredibly grateful for everyone who helped me bring my music to life. I’d like to thank my family and friends for all their support, especially my parents and twin sister, Alexa, and my best bud in the whole wide world, Adriel Miles. I’d like to thank the performers of my music. For Seven Six Word Stories, Fred and Sean, thank you. For ﻿Eternity in Bloom﻿, Gladys and Carolyn, thank you. For La Vida Es Sueño, Lauretta, Renée, Joe, Hamadi, Grace, Austin, Michael, Amy, Lindsey, Marissa, Jake, Courtnie, Cara, Sean, Jason, Ben, Parker, Corinne, Derek, Daniel, Lynda, and Brendan, thank you from the bottom of my heart. It means so much to me that you play my music and all the hard work you have put in to make this dream a reality. Paul, thank you so much for bringing my music to life. One of the greatest experiences a composer can have when working with another musician is being shown something amazing in their own music that they didn’t even know was there. You definitely did this, not only once, but again and again—rehearsal after rehearsal—and it made this entire a process a complete joy. It’s with deepest gratitude that I say thank you. Thank you to my composition professors Jorge Grossmann and Dana Wilson. You will both always be little voices in the back of my head, keeping me at once critical and enthralled by my own music. I am sure that when I am old and grey and full of sleep those voices will still be there having influenced every note I will have written. Thank you to all my other professors who have supported me in my time here at Ithaca College, especially Ivy Walz, John White, Larry Doebler, and Janet Galván. Big thanks to Chris Harris for showing me that anything is possible if you work hard enough. Thank you to my former voice teacher and great friend Carolyn Fisher, for helping my find my voice. Great thanks goes to my old music teacher Jereme Martineau who taught me above all else the true meaning of music and the ferocity with which it must be approached. Thank you to the other Senior composition majors, a.k.a. The Composer Quadruplex, Jake, James, and Adriel. You three are so important to me, and I’m so happy we are friends. Thank you to my videographer Ian Wiese, the ushers for this performance, and IC recording services. Thank you to my friends here at Ithaca, back at home, and abroad for their immense support: Justin, Leanne, Kamila, Keegan, Shaylyn, Colin, John, Chelsea, Brendan, Kevin, Ryan, and Olivia. If you’re not in this list, it doesn’t mean you are not important—there are too many to name. Oh! There's also a minute-long video of a jazz arrangement I did floating around on my YouTube channel if you're interested. It cuts out halfway through because my phone ran out of memory. Still, you can hear the head which is pretty nice. It's a solid chart, and I might get more mileage out of it in the future, but I currently have no plans to have it reperformed. A piece for wind ensemble. A piece for clarinet and guitar. A piece for soprano and piano. A piece for low register chamber instruments. That's seven pieces. Seven goals I'm setting for myself. It's a lot of work, but I have no time to rest on my "recital-laurels." And is it really work if you're having fun? Bit of a dry spell on the blog since last Spring. Lemme get you all up to speed! Summer was great! Spend a large portion of it working at Toast Wines in West Hartford. Wine has become a great hobby of mine recently, and I love trying different kinds from all over the world. Ended up learning a ton about it, and going to various tastings and things, but now I'm back at the old grind, making preparations for my senior recital which will occur on November 16th! Woo hoo! Oh! Also managed to catch the Bang on a Can Marathon this summer to hear 8 straight hours of new music! It was a great time with friends Brendan Fox, Keegan Sheehy, Alyssa Rodriguez, Liam Sheehy, and Nicole DeMaio. One of my favorite bands, the vocal ensemble Roomful of Teeth, performed a set of three awesome pieces! Two were selections from Caroline Shaw's Pulitzer Prize-winning Partita for 8 Voices, and the third was one of my favorite pieces ever--A E I O U by Judd Greenstein. Seriously cool stuff, if you haven't heard that piece, give it a listen. Also managed to meet a couple of the performers in Roomful of Teeth after the performance. They're all really great people, and I can't wait to see what they do next! Anyway, for more pics from the Marathon, check out the ﻿Photos﻿ page in the menu above! Speaking of the Photos page, I've recently had a few newer photos of myself taken. Those will slowly be replacing most of the pictures of me on this site and on my various social media platforms. It's good to keep those sorts of things up to date. I also think I just look a little better now, ha ha. Did some exercise over the summer and started eating more healthy food like fresh veggies and lean meats (Paleo, anyone?) and I feel a lot healthier in general nowadays which is awesome! I've also started learning my way around the kitchen. This summer was the summer of sauté and wine sauces, and just recently I bought a cast iron Dutch oven which I plan to use for discovering the wonderful world of the oven. That means braising, baking, and broiling, baby. Boom! That's a lot of alliteration. More Bs than my sixth grade report card—what! (I'll show myself out...). I started out with simple sauté-ing because something about seeing the food cook right there in front of you seems less intimidating than putting it in a box for a set amount of time and crossing your fingers (my oven at school doesn't have a window). Even checking on the food regularly seems kinda nerve-racking to me, but that's the fear that I plan to conquer as I delve into the 3 Bs of #ovenlife. Also got myself a chef's hat to try to dress the part a bit more. If you feel like you're getting more into cooking or just want to bring more joy into the kitchen, I can't recommend these enough. They're like $7 on Amazon Prime. Even wearing them ironically like to cook like ramen or something is hilarious. Still need a funny apron. Haven't been able to decide on one I like, but eventually I'll find something. Until then, I've decided to cook shirtless. Me cutting a zucchini with gratuitous lens flare. This Fall there are a few things coming your way to be on the lookout for ("for which to be on the lookout"?). The first is my upcoming recital, Life is a Dream which will be in Ford Hall at Ithaca College at 7PM on November 16th. It may also be live-streamed as well if you can't make it in person. Working on a chamber orchestra piece for that called La Vida Es Sueño conducted by Paul Grobey which should be really cool! There will also be some more string quartet readings which I plan to write a short piece for ("for which I plan to write a short piece"?) later in the fall. I may also be writing short pieces for solo Bass and piano. We shall see. Could be cool, hey! The next music-based blog post you can expect from me will probably be shortly before or after my recital. Until then I need to focus my energies on writing! I'm also considering doing some wine tasting blogs on here just for fun. If that's something you'd be into, let me know! Woo hoo recital! Music! Ahh! Gonna start this post off with a really intense-looking picture of me and three of my composer buds. This was taken during a dinner party at Dr. Sally Lamb McCune's home in Ithaca, NY. I've realized I tend to take a fair amount of selfies when I'm with a group—or gaggle—of composers. Especially if this group involves Adriel Miles, Jacob Gunnar Walsh, and James Parker. So, if you'd like to see more of those, head on over to the Photos section of the site, or "Like" me on my Facebook page to get regular updates sent directly to your news feed! Anyway, I come bearing exciting news! There were several winners of the Ithaca College Composition awards this year. These awards include the Downey Prize for the best piece for choir or solo voice, the Joseph Prize for best piano work, and the Smadbeck prize for best overall composition. I'm happy to announce that the winners of these awards are as follows: The Downey Prize was won by both Jeff Sabo and Michael T. Samson for their choral works "After a great pain, a formal feeling comes" and "The Caves," respectively. James Parker won the Joseph Prize with his stunning piano piece, "Traumatic Enigmatic," and the Smadbeck prize was won by both myself, for "Colorwalk," and Felipe Nieto for "Manuscritos Iluminados." For added drama, I decided to make a really tacky award certificate showing off the prize (this'll definitely be going on my refrigerator. Watch out!). Anyway, I'll try to get some materials from Colorwalk up here on the site in case you feel like checking it out. I'm also still chugging away on the music for my recital. 16 November 2014. Ford Hall, James J. Whalen Center for Music, Ithaca College, Ithaca, NY, USA. Okay, well, I guess I'll go keep writing now. Most of what I'm currently working on is detailed in my previous blog post, so if you're curious go read that, ha ha! Just as an update, the first movement of Eternity in Bloom is all done. Still chugging away on the second one. I also finished completing a piece called COLORWALK for string trio and clarinet (doubling bass clarinet). The piece will be read in a few weeks by members of the Distractfold Ensemble, and if that recording ends up all fine and everything, I'll put it up on here along with the score. Composer & Composer! Me alongside Michael T. Samson. I've also been doing a good amount of singing in the last few weeks! I went on tour around the northeastern US with the IC Choir last week. We sang a very long program with some nice pieces by Haydn and Michael McGlynn, among others. I met some really great new people on tour, and stayed with some incredible families who graciously opened their homes to us as home-stays. I also was able to sing the entirety of Haydn's The Creation on Saturday, March 29th with the IC Choir and the Cayuga Chamber Orchestra, led by Maestro Lanfranco Marcelletti. That was a great time. We performed it in German, which is interesting, because the piece is traditionally performed in the vernacular of wherever it's sung—which in this case would be English—but it makes for some good German practice, so that's always nice. Lanfranco was amazing to work with—really nice man with a keen musical sense and very inspiring. On the evening of Wednesday, March 19th, I also had the pleasure of premiering a choral work by fellow composer, Michael Samson (a.k.a. Michael T. Samson, for legal reasons), entitled The Caves. The piece was a stunning work for men's voices (TTBB plus Tenor Solo). For some reason, I always tend to want to spell the word "recital" with a "b," like the word "subtle. Anyway... speaking of "recibtals," my Senior Composition Recibtal is currently scheduled for Sunday, November 16th, 2014. Put it on your calendars folks! It's gonna rock. The main ideas for the recital are still in the process of forming and crystalizing, but as of now, I'm planning on doing some sort of "concept show." In other words, a lot of student recitals are generally structured so that students go on stage and perform their music and that's it. There might be a theme to the program or maybe a loose story that's told by the way the pieces are programmed, but generally it's very straightforward. This type of thing is okay, and works for a lot of people, but for me it's very refreshing when I go to a recital and there's something special that unifies the entire thing as a total work of art. Now I'm not saying there needs to be flying valkyries and custom set pieces, etc. But I'd like there to be something to make the experience more immersive for the audience. So by the end of the recital, they've really gone on a kind of journey with the performers and the composer. I remember watching the recital of my good friend Keegan Sheehy—an incredible percussionist—in which he played every piece from beginning to end without breaks, and had special material composed for transitions between works. The recital also included a lot of antiphony, with performers situated on different sides of the stage and throughout the audience as well. The show was also extremely well programmed. I remember the very end where there was this extremely intense piece involving many bass drums. The performers hit the last note fortissimo and then suddenly—Bach on marimba. It was an extremely intimate experience that I'll never forget. Another memorable "concept recital" was the percussion recital of my friend and fellow composer R. Aaron Walters. This show had the audience seated upstage facing outward toward the audience, and the performers situated downstage facing the back wall of the stage. A divider was then placed at the lip of the stage enclosing everyone in a shell of sound. Small lamps were placed around the stage for dim lighting, but the main stage lights were left off. Foam earplugs were provided in case certain pieces became uncomfortably loud at close proximity. There was also a lot of improvisation involved in the recital, which was wonderful to watch. Overall, the entire thing was a very unified and intimate experience. This is something I hope to do with my recital. Not sure how I'm going to go about it at the moment. There will likely be antiphony involved. I might try something with lighting. Maybe I'll rope off rows toward the back people don't feel sparse and separated from one another, and I'll have more room to surround the audience with players. Maybe I'll seat the audience in the wings of the stage, and do the whole "shell of music thing." Not sure how that would impact recording. We shall see. Anyway, be on the lookout for that. The event is free and open to the public, so if you're in the area then, come on down! Up next on the radar is a piece for chamber orchestra inspired loosely by themes from La Vida Es Sueño by Pedro Calderón de la Barca. As well as a lot of zen buddhist ideas from lectures by Alan Watts. There will also be Neo-Baroque aspects to the piece (in reference to Calderón de la Barca writing in the Baroque period). The piece is still in its beginning stages, however, and so far I've only sketched out large-scale formal and textural ideas. There are also other ideas to the piece that have yet to crystalize completely. I'll try to keep you all in the loop as I begin to put notes on paper. Oh! Also, I have some more photos from the performances these last few weeks. I'll drop them in the Photos section this time around instead of putting them at the bottom of the post so they're easier to find. Cheers! Before going to the ACDA conference last weekend, I decided to make myself some business cards, just to hand out to whomever if the opportunity arose. They ended up coming in handy a few times, so I thought I'd share how I made them. First off, I highly recommend having at least a dozen or so business cards that contain current information. Even if you don't go to conferences, they can still come in handy. A lot of people I know use Vistaprint to make their cards. If you don't have a lot of time on your hands, and you want something that's gonna look professional without a lot of hassle, they're a great place to find some really nice templates. And they're relatively cheap as well, with different options as far as paper-stock and such. I didn't use Vistaprint. For a few reasons. The main one being that I needed the cards printed fast. Like in a day. I couldn't wait for them to ship. But if I'd had more time, I would've used them. Instead I used Ithaca College's Print Shop to get 60 cards for about 8 dollars. That's less than 15 cents a card. Not bad. I highly encourage any fellow Ithacans to give the Print Shop a try, as they are really friendly, and when you factor in Vistaprint's shipping costs, it equals out to be about the same, if not cheaper. The ones I got have a basic matte finish, but I might try to go for something glossier next time. The problem with the paper (as you can see a bit in the photo) is that unless you have some sort of business card carrying case, the edges and corners will fray somewhat quickly. It's not a huge deal once someone puts the card in their pocket, but I feel like it makes a better impression when you hand someone a card in an immaculate state. Hopefully the glossy ones will be more resistant to this sort of wear. I also designed the cards myself. I didn't like any of the templates Vistaprint had, and I really wanted the card to look personal and unique, so I used GIMP, which is like a free version of Photoshop, to design the font and back. For anyone who's interested in doing this for themselves, make sure you're making the card in high resolution (at least 7x4 inches at 300 pixels per inch). It'll keep the image looking sharp when it prints. I used screenshots of my own music from Sibelius as the background for the cards, and I put some titles of works on the back. I think next time I'll just put my name on the back, since just giving titles of pieces is kinda useless. I'd also have to keep it continually updated every time I write a new piece, which would be a pain. I'll also probably change the image on the back to include chamber music instead of choral music, just so people don't get the wrong idea that choral music is all I write. All in all, making the cards was a pretty painless process. Just took a bit of work. Feel free to let me know what you guys think, or to offer any improvements for next time! Several pounds of Gummy at IT'SUGAR in Baltimore, MD. Yes, that is a picture of a giant Gummy Bear. Over the weekend, some friends and I went down to Baltimore, MD for the 2014 ACDA Eastern Division Conference! It was a great time as usual, meeting lots of new friends and reconnecting with old ones. We also had the opportunity to hear some incredible speakers, listen to some tantalizingly talented ensembles, and check out a couple of local hotspots. I can't recommend going to these conferences high enough to anyone interested in choral music. Well worth the money and travel. Before delving into the juicy details of the conference, I just want to get some composerly things out of the way. I've finished the first movement of the Fingertanz for Clarinet and Piano. You can get a taste of that here. The piece is pretty hard (surprise-surprise) for both the pianist and the 'nettist. Currently persuing getting a faculty member to perform it. We'll see how that pans out. The movement is based on the Viennese Trichord (a tritone followed by a perfect fourth or vice-versa). There are also a few fancy color-trills in there. Anyway, the whole piece is called Eternity in Bloom, and more info about it will be posted to the piece's music page as it becomes available. For anyone who's not totally sure where Baltimore is (or Maryland for that matter, I don't judge), I've stuck a fancy map right here to help you out. After a well-deserved ovation, we headed back to the hotel, which was situated right on the waterfront. Needless to say, after having an extraordinarily long day (4am to 10:30pm, so 18.5 hours) we were pooped. Still, there was a joint reception in the hotel that night for both students and those involved in the International Choral Exchange program. My buddy Adriel--fellow composer who you've probly heard of from other places on this site—went straight to bed, but I decided to head down to one of the ballrooms and see what all the fuss was about. Turned out to be great! I met a whole host of new people—students from Syracuse and Westminster—and caught up with some old friends—Kevin Schneider from Central Connecticut State University, and Dr. Amanda Quist from Westminster. There was also an open bar there, so that was nice. Had couple of glasses of some decent Cab (really earthy and woody if I remember correctly), the depressant effects of which combined with the exhaustion of the day eventually led me back to my hotel room bed where I slept like a proverbial infant. I come bearing great tales of my travels in the last six months! Well, actually... I haven't really traveled anywhere, but I did get a whole lot of writing done! Oh, hey, let's talk about that! So first of all, the first movement of Bedtime Stories is D–O–N–E, done! A fancy-schmancy perusal score is up for all of you to... well... peruse. I won't sugar coat it—the piece is insane. Very, very hard, especially for the vocalist. The piece isn't completely atonal.... I mean there are tonal sections, and the whole thing ends with a very clear cadence in G, but octatonic and chromatic scales abound, not to mention a ton of arpeggiated augmented chords and four-against-three patterns (or three-beat superquadruplets, as Dr. John W. White would say). The amount of expression a vocalist gives to the text is inversely proportional to the difficulty of the music being sung. For most pieces that include text, the text is the most important aspect of the music, and if you cannot communicate the text, then what's this all been about!? Vocalists stereotypically have poor aural skills. This brings me to my reasons for making the first movement of Bedtime Stories hard. Two main reasons were that first of all, I wanted the piece to be very over-the-top and cinematic in its storytelling, and so I felt that I should compromise as little as possible when it came to writing the music that the text evoked in me. If a certain passage was calling out to be set as an arpeggiated augmented triad, then by gum, I was gonna set it as an arpeggiated augmented triad. That said, any unnecessary difficulties in the music, or even in the notation of the music, had to be trimmed. Second of all, I had just come off from writing Lullaby of The Iroquois, and so I wanted to write something more stylistically adventurous. A third reason, however, deals with point number two in our short, clear, and attractive list above. Lots has happened over the last few weeks! On May 30th I went down to Port Washington, NY, on Long Island to see my Lullaby of the Iroquois performed by the Guggenheim Elementary Chorus and the Paul D. Schreiber High School Choir. The performance was quite a success, and rocked my socks, so to speak. I am truly honored to have had such a dedicated performance from these singers! I hope this will be the first of many successful collaborations between Paul D. Schreiber High School and the Ithaca College Composition studios! 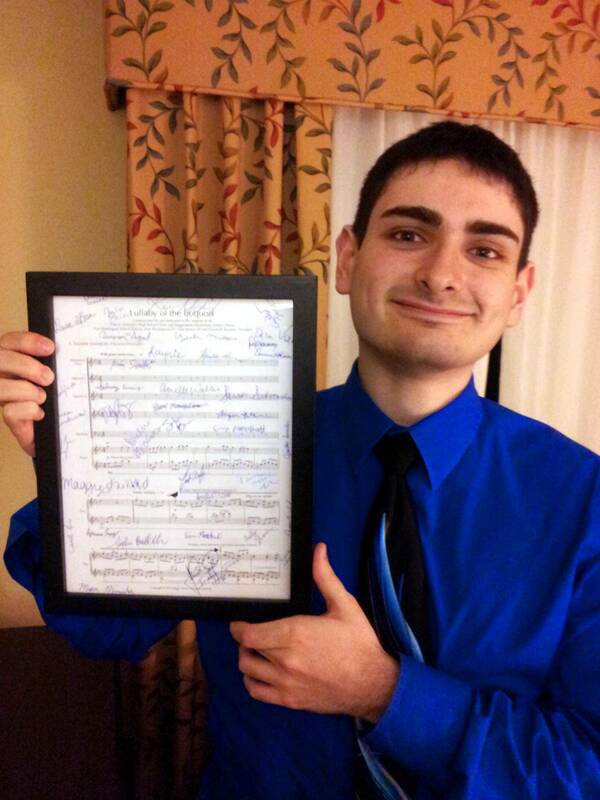 Along with the performance, the singers gave me a really special gift of a framed copy of the score to the piece signed by all the members of the choir. I'll keep this thing forever, ha ha! Thanks, everyone! You can see a close-up of the signed score on the Lullaby of the Iroquois page here on my site. As far as the lullaby goes, I'm going to try to get a couple of arrangements of it out, maybe SSAB and SATB, since it's current instrumentation is somewhat uncommon. Be on the look out for those in the coming days. After the concert, my family and I ended up taking the ferry back to New London, CT on the way back. Don't have any pictures from the ferry, unfortunately. The trip across the sound was nice though. I'd missed the smell of the ocean (up in Ithaca, all we have are lakes), and for someone who hasn't been on a boat in like eight years or so, it was really refreshing to go out on the water, even if it was just a ferry ride (admittedly, by the end it almost felt like I was getting off the S.S. Anne). In other news, I've written a couple of nocturnes for my first collection of them. I think the plan there is gonna be to write a set of fourteen and then take a break from them, and then eventually write the other fourteen at some future time. I've settled on fourteen so I can separate them into "Fortnights," which I think is a cool way of naming nocturnes, ha ha. Along with the other projects I mentioned in my previous post, I'm adding another song cycle to the list (I know, right?). My voice professor, Ivy Walz, is becoming a mother very soon, and I thought I'd surprise her with a funny little song cycle using some of Hilaire Belloc's Cautionary Tales for Children (so hopefully she isn't reading this, since it will spoil the surprise). The tales contain a lot of ridiculous dark humor based on 19th century sensibilities. One story, for example, details a boy who "ran away from his Nurse, and was eaten by a Lion." In fact, most of the stories, I think, were made to scare children into following rules. I mean, if as a child you heard the story of Matilda, who "told Lies, and was Burned to Death," would you ever again tell a lie in your life? I should hope not, ha ha. Well, anyway, as I said, the songs as I'm writing them are meant to poke fun at the ridiculous ideas adults would use back in those days to get their kids to follow rules. Haven't settled on a title for the collection yet, but it'll probably be something ironically innocuous like bedtime stories or something, ha ha (and if I'm reeeeeeally lucky, Ivy might sing them for me some time next year. March maybe? Diane Birr on piano? We'll see). I'll be using this blog to help connect and share more with people. To check my music out, click the "Music" tab on the main banner up top. Composer July 28, 1992 Miggy Torres is a composer and conductor from South Windsor, Connecticut. He has written music of all sorts, but is known especially for his choral and chamber works.